Freedom Network presents a special, exclusive series authored by seasoned journalist and analyst Haroon Rashid that takes a close look at how advancing technologies, transforming social habits and changing information access dynamics are impacting the media landscape in Pakistan and where the country’s media stands in terms of challenges and opportunities in 2014. The series of separate write-ups attempts to analyze the state of television media, radio media and print media in Pakistan in 2014. The second of the three series reports is about the changing face of print media in Pakistan. ‘No one wishes to read yesterday’s news’ not only showcases today’s reality as far news consumption is concerned but also a challenge that print journalism faces in the world, including Pakistan. Millions of instant tweets and Facebook updates have kind of snatched the exclusive “breaking news” privilege from the electronic media. In a scenario, where anyone with a reasonable mobile phone set has become a ‘journalist’ sending out information, pictures and opinions from the actual location is there a need to read that story the next morning? This has blurred the definition of a journalist, news and opinion pieces. BBC Media Action in a recent briefing paper on Pakistani media noted that social and mobile media are increasingly competing with the mainstream media’s gate-keeping and agenda-setting roles in Pakistan by enabling new forms of political communication and co-ordination. Social media platforms currently provide the only opportunity for ordinary citizens – at least those with internet connections – to participate in the national debate with little mediation. But no one medium is more in danger than the print media. Internationally, many publications have already gone completely online or have and are seriously re-think about their content and presentation strategy. Jacek Utko is a Polish architect by profession but strangely deal with newspapers. His efforts have given hope that a good design just might save the printed newspaper. In a recent talk, he says he now designs posters not boring newspaper pages. He has redesigned papers in Eastern Europe not only to win awards, but increase circulation by up to 100%. But of course content is equally important. The well-regarded newspaper claims that the job of print now is “to provide the second, more thoughtful draft of history after television, Twitter and text phone messages have provided the initial information.” But also the visual changes are unprecedented. Nowhere in the past the paper carried as much photographs and graphics as it does now, perhaps responding to availability of these formats online that come to be ubiquitous. It appears that sooner or later other newspapers in Pakistan will have to follow Dawn. Interesting will be to see which way the clogged, cluttered Urdu newspapers go. They too are hit by the changing social information habits but not to the extent that English newspapers are, because the Twitter/Facebook user is mostly English reader. 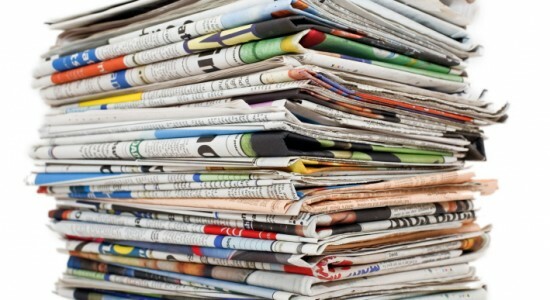 Official data shows that the number of newspapers and periodicals in Pakistan have already come down from the highest of around 2000 in 2005 to only 749 in 2011. The slide is no doubt steep for mostly English language periodicals. On the other hand the internet penetration is on the constant rise. A survey conducted by The Express Tribune daily in Pakistan in 2013 showed that most of the internet users claimed they use the net first for social media, second for emails and thirdly for news. The lines are already drawn here as far as the internet user preferences are concerned. The only thing holding social media back is, as the BBC Media Action report claims, by the low levels of internet access, which remains largely urban and male-dominated. Only 9-16% of Pakistan’s 180 million-strong population has access to the internet – a total of 20-30 million people in all. In the UK, the Croydon Citizen, a web site where members of the public become content contributors, has in December 2013 launched a free monthly print magazine. The 16-page publication was initiated in an effort to reach new readers not already finding the content online, to introduce new revenue streams and to allow the team to be more ‘creative.’ This has not yet been tried in Pakistan, but maybe if the social media keeps going the way it is, newspapers will have to resort to new tactics to remain in business. The author is Editor BBC Pakistan. Hi there. its been almost a year this article was written and today I went through this. I would like to appreciate all the efforts put by the team in presenting this comprehensive report over print media in Pakistan. Here, I am concerned about the last paragraph where you mentioned an international free monthly online magazine and there is none in Pakistan. For the record I started this sort of magazine named ‘Divvy Magazine’ from Rawalpindi as a volunteer work and produced three editions that were really appreciated. We also had the domain http://www.divvymag.com But due to my graduation, I could not give it much time.